(Phys.org) —Invisibility cloaking is no longer the stuff of science fiction: two researchers in The Edward S. Rogers Sr. Department of Electrical & Computer Engineering have demonstrated an effective invisibility cloak that is thin, scalable and adaptive to different types and sizes of objects. Professor George Eleftheriades and PhD student Michael Selvanayagam have designed and tested a new approach to cloaking—by surrounding an object with small antennas that collectively radiate an electromagnetic field. The radiated field cancels out any waves scattering off the cloaked object. 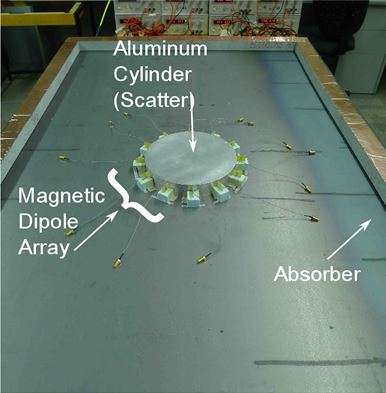 Their paper 'Experimental demonstration of active electromagnetic cloaking' appears today in the journal Physical Review X. "We've taken an electrical engineering approach, but that's what we are excited about," says Eleftheriades. "It's very practical." Picture a mailbox sitting on the street. When light hits the mailbox and bounces back into your eyes, you see the mailbox. When radio waves hit the mailbox and bounce back to your radar detector, you detect the mailbox. Eleftheriades and Selvanyagam's system wraps the mailbox in a layer of tiny antennas that radiate a field away from the box, cancelling out any waves that would bounce back. In this way, the mailbox becomes undetectable to radar. "We've demonstrated a different way of doing it," says Eleftheriades. "It's very simple: instead of surrounding what you're trying to cloak with a thick metamaterial shell, we surround it with one layer of tiny antennas, and this layer radiates back a field that cancels the reflections from the object." Their experimental demonstration effectively cloaked a metal cylinder from radio waves using one layer of loop antennas. The system can be scaled up to cloak larger objects using more loops, and Eleftheriades says the loops could become printed and flat, like a blanket or skin. Currently the antenna loops must be manually attuned to the electromagnetic frequency they need to cancel, but in future they could function both as sensors and active antennas, adjusting to different waves in real time, much like the technology behind noise-cancelling headphones. Work on developing a functional invisibility cloak began around 2006, but early systems were necessarily large and clunky—if you wanted to cloak a car, for example, in practice you would have to completely envelop the vehicle in many layers of metamaterials in order to effectively "shield" it from electromagnetic radiation. The sheer size and inflexibility of the approach makes it impractical for real-world uses. Earlier attempts to make thin cloaks were not adaptive and active, and could work only for specific small objects. Beyond obvious applications, such as hiding military vehicles or conducting surveillance operations, this cloaking technology could eliminate obstacles—for example, structures interrupting signals from cellular base stations could be cloaked to allow signals to pass by freely. The system can also alter the signature of a cloaked object, making it appear bigger, smaller, or even shifting it in space. And though their tests showed the cloaking system works with radio waves, re-tuning it to work with Terahertz (T-rays) or light waves could use the same principle as the necessary antenna technology matures. "There are more applications for radio than for light," says Eleftheriades. "It's just a matter of technology—you can use the same principle for light, and the corresponding antenna technology is a very hot area of research." So lets say a planet had reached the tech stage of ET life seeking and had lots of antennas pointd outward, the effect of listening would also be an effect of cancelling out any listening antennas aimed at Earth? So the ETs would get the same answer we have been getting? Nobody there? Not quite, katesisco, if we were looking for ET we would look for stuff that didn't look normal. So if you have a planet that is modulating signals it receives or has an abnormally high absorption rate for certain wavelengths it would be a sign of intelligence. I think this is pretty amazing that we live in an age where we are discovering the true magic of the universe. Right at the end of the article he says its easy to do with visible light, just less useful. So, if I cloak a building, for example, what do I see in its absence? Do I simply see whatever is behind it? What is the effect on the incoming light that would pass through the building given that it is being cancelled out by the transmitters on the other side? And can't you just see some prankster cloaking a large rock in the middle of a highway. I hate this line of crap that people like Walters espouse. 'They do it just for the grant money' ad nauseum. What they've created is not an invisibility cloack, but a very efficient radar absorber. Just like creating the world's blackest object isn't going to make it invisible. Quite the opposite. It's very easy to spot because everything else isn't black. Surrounding e.g. a ship with these antennas would not make it invisible because it would appear as no radar echo from a spot where there should be an echo coming from the water. What they have created is a system that negates the effects of reflected emissions (and ONLY the REFLECTED emissions. Not the otherwise absorbed ones which are passsed through). Eikka do work in this field? I thought of using these cloaks to cloak out the secondary mirror of a Newtonian mirror telescope. By doing so, one can get rid of all those streaks you see around stars in astronomy pictures. Also, those diffraction spikes are at every little point throughout the rest of the picture; get rid of all this, and we can get a significantly better astronomical image. I tried e-mailing and talking to astronomers about this, but I couldn't get any response! And don't do they? We have more important, perspective and useful things to research. The prioritization of research is what the contemporary science is badly lacking. Who should "prioritize" the researches? The Big Brother? You? And what you want to do to scientists who don't follows your priorities? Send them to a re-education camp? Invisibility cloaks are much less practical than the anti-gravity magnetic aether motors, right? Was someone not paying attention to the actual FULL results of this experiment? For the above device, light/EM would be APPARENTLY reduced to nothing at the point where the two opposing signals cancelled one another out. But the energy of those signals is not erased, it simply becomes invisible for that instant where the two wavelengths are exactly the same frequency and intensity, with exactly opposite nodes/antinodes. After that point, both through dispersion and endless varying gravitational distortions, the signals would "reappear". What the above illustration shows is a device that can make itself invisible at the point of the border of the experiment. Both before and after that point, the EM/light/waves will become visible again. So, if I cloak a building, for example, what do I see in its absence? Do I simply see whatever is behind it? Based on the description given, you will see nothing, which could cause problems when holes appear where they shouldn't. Given some time to mature, a pass-through system could be implemented so that you would see what's on the other side. What is the effect on the incoming light that would pass through the building given that it is being cancelled out by the transmitters on the other side? This system only works for a single frequency, and is effective in the radio frequency range - not the visible spectrum. What you can physically see would not change. This seems less like an invisibility cloak and more like sophisticated RADAR jamming. Observing both the authors' and many of the commenters' lack of understanding of the basic definition and concept of the term "invisible" is highly informative as to their respective depth, intellectual quality and other limitations regarding making potentially meaningful contributions. While I agree with you, it would be nice if you could make a meaningful contribution yourself, instead of just ripping on others. I thought of using these cloaks to cloak out the secondary mirror of a Newtonian mirror telescope. By doing so, one can get rid of all those streaks you see around stars in astronomy pictures. Also, those diffraction spikes are at every little point throughout the rest of the picture; get rid of all this, and we can get a significantly better astronomical image. ... I tried e-mailing and talking to astronomers about this, but I couldn't get any response! At least you're thinking outside of the box, but how do you imagine that destroying the optical properties of the secondary mirror is going to improve your images? The point of the cloak is to disrupt the optical properties of a surface. The point of front surface mirrors is to preserve the optical properties as perfectly as possible. You can't have it both ways.